Not many people can say they rode on a bicycle with pope John Paul II, but that was just one of many encounters in the colourful life of Helen Griff. The two were students in Germany, working in the underground during the Second World War. Ms. Griff, who was 17 at the time, had just been given a list of 32 names of people who were to be executed the next day. The list was on pieced-together carbon paper, plucked from a garbage bin by a woman who was responsible for cleaning the German headquarters, but wasn't sympathetic to their war effort. She tracked down Ms. Griff, originally from Poland but studying in Germany at the time, who set out to find the doomed. The determined girl managed to find 30 of 32 and warned them. Twenty-eight fled and the two who didn't believe her were indeed killed the next day. "The Germans were occupying all the roads and bridges and everything else," said her only child, Victor, who didn't remember the exact town where this took place. "She walked between the railroad tracks and the river." On bridges where she had to cross because there was no other way, she tricked the Germans, Mr. Griff explained. She carried a basket with a newborn kitten, which shielded the list. When the Germans would stop her, she'd simply point to the kitten and tell them she was taking it to her aunt's home. It was risky, but it worked. Ms. Griff went on to obtain two PhDs in chemistry, lived in Casablanca after the war before being able to secure a passport, and eventually came to Ottawa to teach. She spent the past 48 years in Ottawa and died at the age of 87 last Thursday, coincidentally on International Women's Day. The day after her journey to save those on the list to be executed, she was on a similar trek, carrying "food stamps or lists, or something or other," said her son. At the end of her mission, walking along the railroad tracks, she met the future pope, known then by his birth name, Karol Wojtyla. He and another seminarian were on his bicycle and they offered her a lift, while protecting her with their robes past several checkpoints, to a train where she wouldn't be discovered by the Nazis. "That was her more memorable meeting with him, but they were acquaintances because they studied together in Germany," Mr. Griff said. Over the course of the war, she returned to her home town a couple of times and the last time she went, her well-to-do father's house and both grandfathers' houses were destroyed, as was the factory where the family built machinery. She lost every member of her family during the war -- her father, her sister, her stepbrother and stepmother. The last news she had of her father was that the Russians had taken his wife and him to Siberia, but to different locations. She never saw or heard from him again. Ms. Griff met her husband, Alex, in Germany after the war. He was living in a Russian camp for former prisoners of war and she was in a Polish camp. He pursued her aggressively and, though she turned down his first two proposals, she eventually gave in. At this point, Ms. Griff had a PhD in chemistry, but was, at the time, working as a secretary and translator. That wasn't a problem for the woman who could read, speak and even teach as many as seven languages, including French, German, Russian, Ukrainian, Polish, English and Arabic. The Griffs were married in a Catholic church in 1947, but were then told they had to be married again in a Russian Orthodox church in order to live together in the Russian camp. Two months later, they obliged and forever more they celebrated two anniversaries per year. Soon after, they moved to Morocco, where Mr. Griff's skills from his wartime service were attractive. Her skills were, too. "My mom's skills were so multifaceted it was almost beyond belief," said Victor Griff as he recounted how she'd cooked a meal in the Polish camp and, based on that single meal, an American told her he'd give her $100,000 to start a restaurant in California. In Casablanca, Victor was born and a couple of years later, Ms. Griff was pregnant with her second child, a girl, when she visited the market with her son. She heard an announcement saying there was a stolen car coming through the "eight-car town," but she only had time to get her son out of harm's way. She was hit and lost her daughter; she wasn't able to have children after that. "So, after that, she wasn't all that keen on Morocco any more," Victor Griff said. That's when the Griffs moved to Montreal, where Ms. Griff got a job before her husband. She also drove -- having come from an affluent family -- before her husband did and picked up their first car, a Ford Anglia, in 1957. Mr. Griff learned to drive a few years later. After a short stint working in a "sewing sweat shop" in Montreal, she went to work in a hospital lab where, initially, her German PhD wasn't valued highly. She quickly convinced coworkers she was quite capable. She went from there to McGill, where she taught for several years and obtained her second PhD. At McGill, fumes from a student lab accident caused her to faint and gave her permanent skin damage. Her hair fell out and never really came back. From then on, she wore a wig, her son said. In 1959, Ms. Griff moved to Hull to take a position at the University of Ottawa; Mr. Griff, who was working construction in the North, followed 18 months later. The two moved to Ottawa a couple of years later. Ms. Griff spent a few years at the university before taking a position at the Kemptville Agricultural College. She left Kemptville after about four years when her son had a car accident that put him into a coma. Before she left the college, she established a scholarship in her name and this year will be the first in 40 that she won't be there to present it. Linda Reasbeck, who taught with her at Kemptville College, said her students remembered her as "very highly qualified, but also patient, generous and helpful." Ms. Reasbeck remembers her showing up last year to present her award and, while she was frail, her mind was in top form. Her final teaching job was at Carleton University, where she also stayed for a few years until she broke both her arms, her son said. In the first instance, she slipped on a wet floor. The second happened when she slipped on the ice, while the first was still in a cast. By then in her 60s, she decided it was time to retire. She turned to painting, hooking rugs, corresponding with old friends overseas and continuing her involvement in the Rosicruceans' Ottawa chapter, a non-denominational group that has esoteric, metaphysical and spiritual beliefs. Alex Griff, who worked in maintenance at Carleton University for many years, died in 2001. 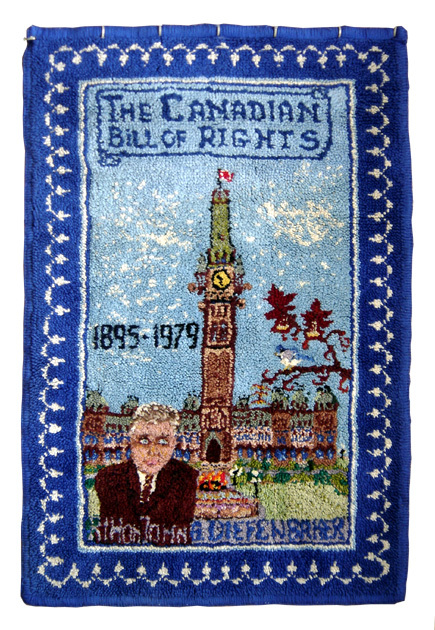 "The Canadian Bill of Rights"